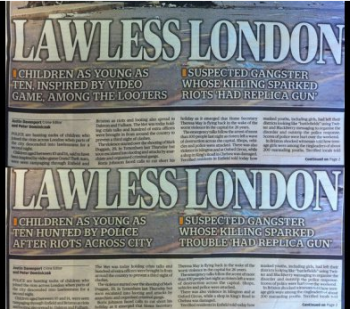 The first newspaper that blamed videogames for the riots in Britain has backed off, but another tabloid has taken its place. Nobody was exactly surprised when the British media started blaming the current riots on videogames. After all, games are still a favorite scapegoat of various mainstream newsgroups. However, it turns out that the newspaper to originally accuse games of corrupting the country's youth has quietly stopped doing so, but another tabloid is still riding the anti-GTA bandwagon. A few days ago, U.K. newspaper The London Evening Standard ran a sub-headline that claimed "children as young as ten, inspired by video games, among the looters." However, in the reprinted edition of the same issue, the Evening Standard changed the print to read, "Children as young as ten hunted by police after riots across city." According to Computer & Video Games, the change is due to pressure from both it and other media outlets publicly shaming the paper for its accusations. "A policeman said last night that children involved in the rioting and stealing were inspired by violent video game Grand Theft Auto. "The hugely popular computer game, which should not be played or bought by anyone under 18, is popular among teenagers, with many having the game given to them by their parents. "In Tottenham, the scene of the first riots on Saturday night, a police officer said: 'These are bad people who did this. Kids are out of control. "'When I was young it was all Pacman and board games. Now they're playing Grand Theft Auto and want to live it for themselves." Let's be honest, this is nothing new. The Daily Mail has a history of accusing Rockstar's games of turning children into felons. At least the Evening Standard backed off on this baseless accusation.